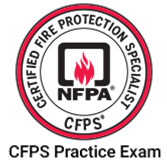 The Certified Fire Protection Specialist (CFPS) credential was created in 1971 for the purpose of documenting competency and offering professional recognition for individuals involved in curtailing fire loss, both physical and financial. Since then, CFPS has been awarded to more than 4,000 people who have demonstrated a level of professionalism through applied work experience, related education opportunities, and successful completion of a certification examination. This group of professionals includes risk managers, loss control specialists, fire officers, fire marshals, fire inspectors, safety managers, fire protection consultants, designers, engineers, code enforcers, facility managers and others who have responsibilities dealing with the application of fire safety, protection, prevention, and suppression technologies. Get more information, including eligibility requirements and how to apply. CFPS has transitioned from paper-based mail through the postal service to electronic notification. E-mail is now our sole method of correspondence. In an effort to ensure information of importance to applicants and CFPS Certificate Holders, it is imperative each one of you verify all your contact information. Of particular importance is the verification of your email address. Watch a brief interview with CFPS certification holder, Jim Mundy. Enter CFPS Online services. To obtain your Username or Password, please contact the CFPS office. If you’re a first time visitor to CFPS Online Services, you must register. 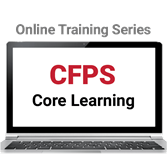 Save on must-have NFPA code training with the CFPS Core Learning Series. Are you ready to take the CFPS exam? Prepare using the Practice Examination! How to become certified All the information needed to become CFPS certified. For CFPS certificate holders Directory, handbook, newsletter, policies, and more.